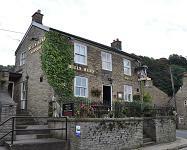 A very old village pub dating from the late 1700s, it was completely re-furbished in 2004. I am pleased to say that they have retained the individual rooms providing cosy alternatives to the open bar area. It is now a very pleasant modern village pub, a great improvement on what went before. Brews: Robinson’s Unicorn and Hatters, Stella, Carling, Strongbow and Guinness. Food: Wednesday – Sunday, check before travelling! 01625-575522. They specialise in authentic Spanish Tapas and have made a name for themselves with it! Other facilities: There are two gardens to sit in on a warm day. No dogs inside (except assistance dogs) – please put them in the back garden. Finding it: Kerridge is just above Bollington; turn up Grimshaw Lane opposite the Bayleaf Indian restaurant and follow the road round to Kerridge. The Bull’s Head is on Oak Lane at its junction with Redway and Jackson Lane in the middle of the village.